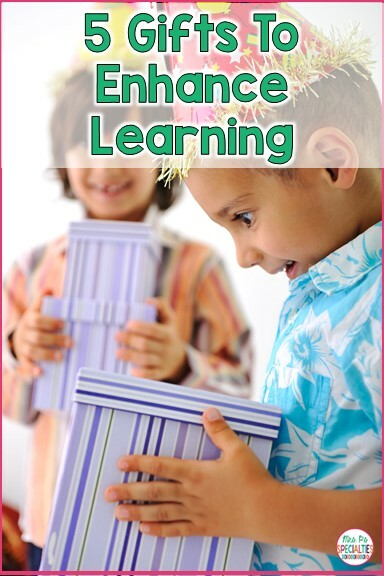 5 Gifts To Enhance Learning | Mrs. P's Specialties! Every year, I get families asking me for suggestions on gifts for their children. It is the perfect opportunity to suggest alternatives to video games and screen time! Here are some of the things we suggest. Kinetic sand is a favorite with all of my students. I especially like this set that comes with multiple colors. It is the perfect time for students to start talking about which colors they are using, how they are using them, etc. Once you start playing with this sand, you just can't stop! That means our students' siblings are going to want to play with them, too. Playing and talking with other kids makes this gift ideal!! Hedbanz is a great way to reinforce language and social skills. Students will get extra practice with describing, listening, questioning, etc. As if that weren't enough, students will also practice taking turns, not always winning and playing with others. This game is fun for the whole family. This Gravity Maze Marble set is all sorts of fun. It will challenge students to problem solve and use their visual processing skills. The cards come with multiple levels, so it as students progress they can still use it. The Lego Remote Control set has a ton of benefits for our students! First, students have to build the car. Then, they get to play with it. Students will have to use fine motor skills to make it go, visually track where the cars go and then use gross motor skills to go get it and do it again. These Magnetic Tiles are great for students with motor delays. The magnets are magnetic, so pieces will stay where students put them even if they don't have enough motor control to push hard. These gift ideas are great for our classrooms, too! Pin this post so you can refer back next time the PTA or family wants to buy something for the classroom!